Maryville University’s Kids Rock Cancer program will be honored by FOCUS St. Louis during its 20th Annual What’s Right with the Region! awards celebration on May 11. Honorees were nominated by the public and selected by a panel of community judges for their impact and service to the community. Selected as an honoree in the Promoting Stronger Communities category, Kids Rock Cancer is recognized among organizations working to address problems, develop initiatives, or make lasting improvements that result in stronger, more stable communities. Kids Rock Cancer is a music therapy program designed to help children cope with the unique emotional challenges that accompany a diagnosis of cancer and other blood disorders. 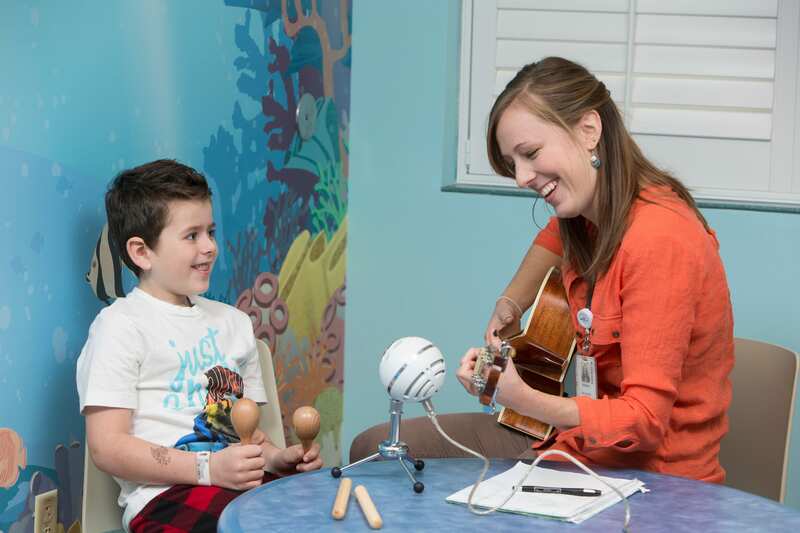 Through the healing power of music therapy, Kids Rock Cancer helps children combat feelings of anxiety, depression and helplessness. About 800 original songs have been written and produced in pediatric hospitals, cancer support centers and summer camps throughout the St. Louis area. Working with a music therapist, children participating in the Kids Rock Cancer program write about whatever topic they choose. Their lyrics are put to music and they record their own voice on a CD to take home. Writing and listening to these songs help children make sense of what is happening to them, express fears, frustrations and hope, and just have fun. The program also provides hands-on learning for students in Maryville’s music therapy program. In creating opportunities for students to engage in practical learning experiences, Maryville seeks to respond to needs in the St. Louis community, providing a win-win for graduates and the region. Kids Rock Cancer is one the University’s most successful and impactful community connections. More recently, Kids Rock Cancer has expanded to help kids whose family members are battling cancer. These children may have trouble processing the impact of life-changing events like cancer diagnosis and treatment. Creating a story through music helps not only the kids but the entire family understand one another’s feelings and concerns.